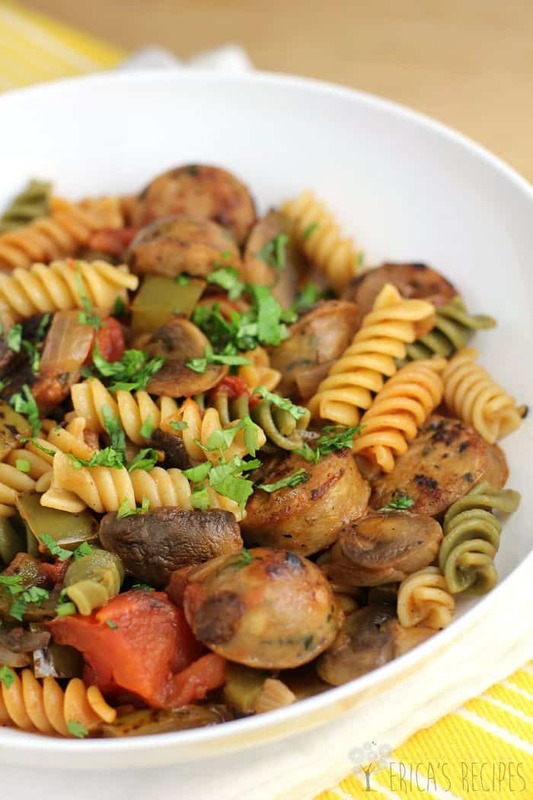 This easy Sausage and Pepper Pasta meal is a delicious pasta spin on sausage and peppers, prepared thoughtfully using better ingredients. Pair with a side salad for a weeknight dinner you can feel very good. With lunch leftovers the next day that will rock. Sooo, yes. 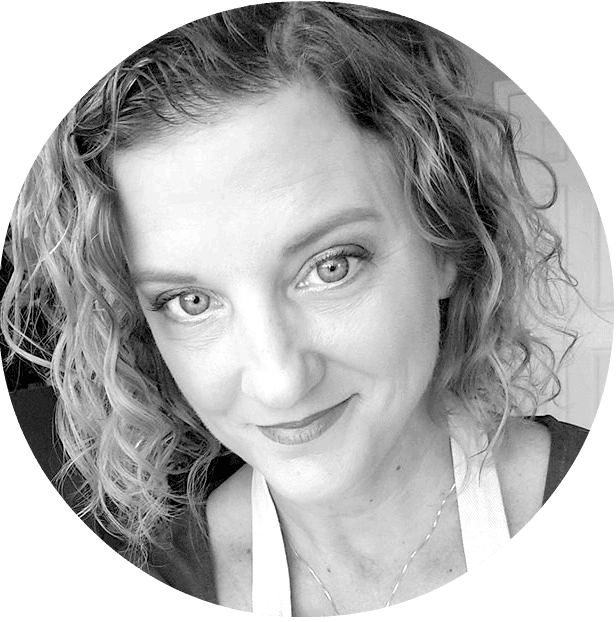 Here I am in mid-ish-December – in the midst of cookies and Christmas spirit, dropping off a little pasta dish to the world. To you. Because you are busy as hell. As am I. So I thought it more useful to help you out and give you a new weeknight number. And this recipe was so easy …like, really easy folks, to drum up as dinner for my family. And it was so loved. Italian sausage and peppers, either in a sub or alone, is an outstanding traditional Italian-American dish. Just another reason why I wish I was Italian. This super simple rotini variation with healthier chicken sausage, easy canned tomatoes, and always awesome fresh bell pepper was totally delicious. So here it is kids! The holidays and all the shopping and wrapping that goes with… we got this. 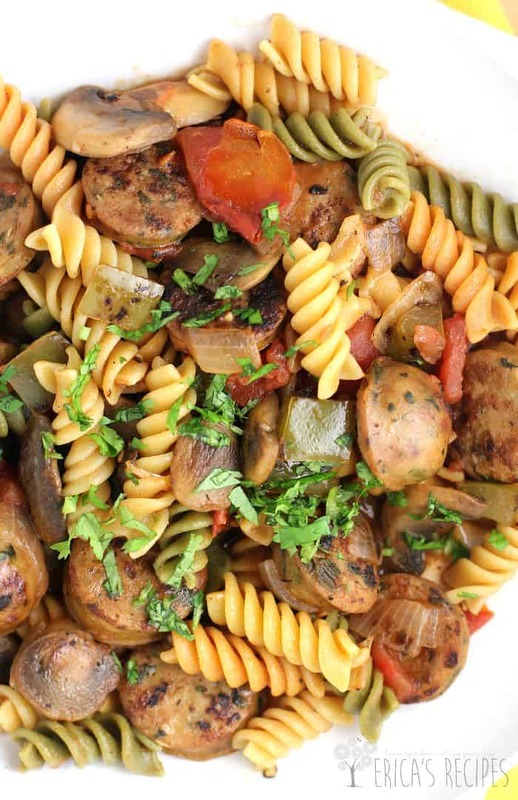 Here is a healthy Sausage and Pepper Pasta dinner to help get us there and free us up to enjoy the season. 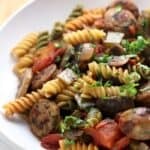 This easy Sausage and Pepper Pasta meal is a delicious pasta spin on sausage and peppers, prepared thoughtfully using better ingredients. Bring a large pot of water to a boil. Add the pasta and cook to al dente. While pasta is cooking, heat 3 teaspoons olive oil in a large, nonstick saucepan over high heat. Add the mushrooms and cook until well browned. Transfer the mushrooms to a plate and set aside. In the same pan, heat the remaining teaspoon olive oil. Add the sausage, green bell pepper, and onion, along with a good pinch salt and pepper. Cook until the veggies just start to soften and the sausage is browned. Add the wine to the pan to deglaze. Cook for a minute to reduce. Add the tomatoes with their juice and simmer a couple minutes. Add the pasta, toss, and allow the pasta to finish cooking in the sauce. Serve topped with fresh parsley. Yields 4 servings. I love recipes with chicken sausage. This is perfect for dinner next week. Quick & easy dinner ideas are a must during the busy holiday season! 🙂 Love that this is healthier too. 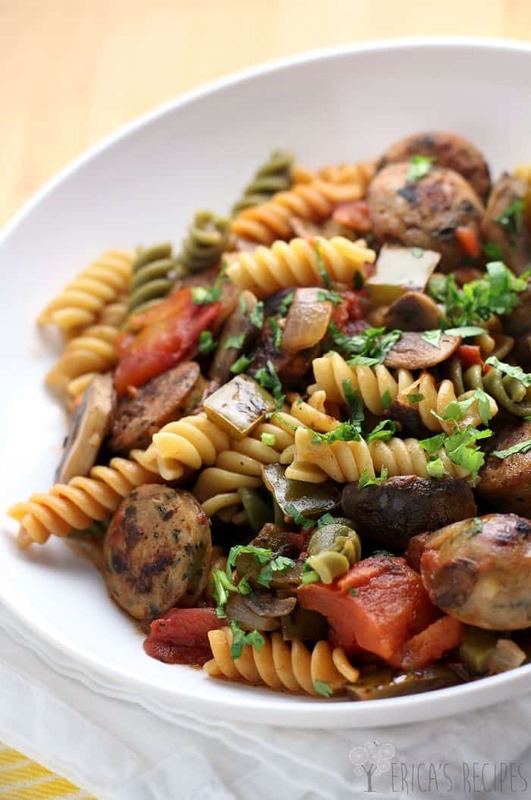 I love pasta with sausages and this sure looks deliciously perfect! I bet the red wine adds a lot of flavor, too!